Making the kid fall asleep is indeed one of the toughest tasks for first-time parents. And, it becomes more terrible if you have a fussy baby, right? Wondering, what to do in such cases? Here are the Top 10 Baby Sleep Tips for First Time Parents to make their parenting experience smoother and more convenient. Let’s check out them by turns in the following without delay! The most effective tip for baby sleep is breastfeeding taking the kid on your lap either on your favorite breastfeeding chair or simply on the bed. Besides, remember to cuddle the baby with great affection when you think that your baby needs to sleep. It will make the baby feel secure and safe and help to take a deep sleep. In other words, when you breastfeed the baby, it naturally sleeps longer. Your baby likes the warmth of your body so when you put them in the crib, they may wake up. Prewarming will help in this regard. Try to wrap a blanket around a heating pad and put it on the baby’s bed top warm it up. When you are done with breastfeeding, gently place your baby between the folds of your warm blanket. It will give your body warmth to your baby, and the baby will get to sleep well. As a new mom, you need to know how to burp the child. After every breastfeeding, take your baby on your lap and put the baby on its belly. Now gently pat the back in rhythm. After some moments you can hear the baby burping which will soothe the baby and comfort him or her. When the child cries, try to soothe by swinging singing, cuddling with great care and affection. These will let the baby sleep well for sure. The dad may hesitate to participate in this task but relax! Try to engage him by assuring him that he too can do the job. Allow him to spend time with the baby without criticizing him. Teach him how to cuddle the baby and take him on the lap. When daddy gets involved, the baby gets used to his presence, and the father can soothe the baby too. Thus, you can have some time for you which will allow you and the baby to have a sound sleep as well. Different swaddling techniques allow the baby sleep longer. Swaddle the baby safely, and the baby will think that you are with him or her though you are not there. It relaxes the baby and gives the feeling of safety. Make sure that the swaddle is not too tight or too loose. If it is tight, then the baby may have a breathing problem. If you want the baby to sleep longer at night, limit the day nap time, and I assure, you will find a significant change in your kid’s sleeping pattern. When the baby takes longer naps during the daytime, he or she refuses to sleep at night. For this, you should take care of this fact tactfully. Another useful tip for baby sleep is baby massage. Apply baby oil all over the baby’s body before bathing and gently massage everywhere. You can consider it as a game. It will stimulate blood circulation all over the body, and the baby will get to sleep longer comfortably. Make a daily routine of eating, wake up, and sleep cycle. It will allow full feedings immediately after waking. Then the baby will play for some time and then get it to sleep. It will help to maintain a healthy life when the baby grows up. Co-sleeping is a great way to make your child sleep longer. 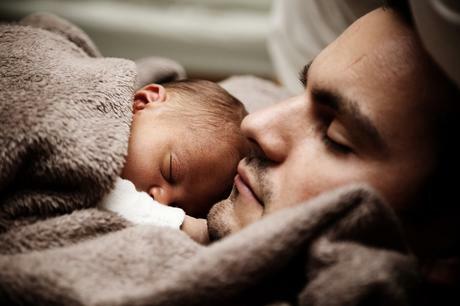 When you sleep with your baby, it can have the warmth of your body and your smell which he or she is familiar with. This will give a feeling of safety and security to the baby as well as the fuss and cry will come to an end. Both of you and the baby can have a sound sleep together this way. While concluding our post, we hope you read between the lines and got to know some of the most effective Baby Sleep Tips for First Time Parents. Now, it’s your turn to follow the sleeping hacks for newborns as mentioned above and develop a convenient sleeping pattern for the kid as well as yourself. Hope the parenting article was helpful and you had a pleasure reading!